WEST LAFAYETTE, Ind. -– The Conservative Coalition for American Values, a Purdue University student organization, hosted a bake sale today designed to demonstrate the racial divisiveness of University affirmative action policies, specifically the mandated use of racial quotas and admitting students based on their skin tone. The Executive Project Director of CCAV, Tim Arehart, felt compelled to organize the sale. “I was appalled when I learned that racial targets, not merit alone, granted professors positions at Purdue and students admittance at many major universities. I don’t think that fighting discrimination with discrimination justifies Affirmative Action,” Arehart said. 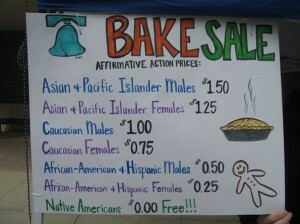 Affirmative action bake sale prices were weighted to reflect Affirmative Action polices and programs. Asian and Pacific Islander males were charged the most at $1.50 per baked good, and Native Americans were charged nothing for their bake sale sweets. Other races and sexes varied. Affirmative Action is a major component of the college admissions process at Purdue and has an office dedicated solely to implementing the program (Office of Institutional Equity — formerly the Affirmative Action Office). Affirmative Action mandates the use of quotas to set aside a portion of college entrance positions based on a person’s skin color, ethnicity, and gender. The bake sale was held on the south side of the Class of 1950 Lecture Hall and featured weighted pricing scale that, according to organizers, reflects the Purdue University affirmative action policies. Asian and Pacific Islander males are charged the most at $1.50 per baked good, followed by Asian and Pacific Islander females ($1.25), Caucasian males ($1.00), Caucasian females ( $0.75), African-American and Hispanic males ($0.50), African-American and Hispanic females ($0.25), and Native Americans ($0.00). The Conservative Coalition for American Values is a non-partisan student organization at Purdue University that seeks to spread conservative ideas throughout the Purdue campus and the surrounding community. CCAV has more than 40 active members. For more information about CCAV, see http://www.purdue.edu/conservative.